Eps 1 - The World Peace Prize. Who's Getting the 100 Million Zeni?! Eps 2 - To the Promised Vacation! Vegeta Goes on a Family Trip?! Eps 3 - Where Does the Dream Continue?! Find Super Saiyan God! Eps 4 - Aim for the Dragon Balls! Pilaf Gang's Great Strategy! Eps 7 - How Dare You Hit My Bulma! Vegeta's Furious Mutation?! Eps 8 - Goku Steps Up! The Last Chance From Beerus-sama?! Eps 9 - Sorry for the Wait, Beerus-sama: The Super Saiyan God is Finally Born! Eps 10 - Show it Goku! The Power of the Super Saiyan God!! Eps 11 - Let's Keep Going, Beerus-sama! The Battle of Gods Continues! Eps 12 - The Universe Crumbles?! Clash! The God of Destruction vs. Super Saiyan God! Eps 13 - Goku, Go Surpass Super Saiyan God! Eps 14 - This Is the Last Bit of my Power! Conclusion to the Battle of Gods! Eps 16 - Vegeta Becomes a Pupil?! Take Down Whis! Eps 17 - Pan is Born! And Goku Goes Off on a Training Journey!? Eps 18 - I've Come Too! Training Begins on Beerus' Planet! Eps 19 - Despair Once More! Revival of the Evil Emperor, Freeza! 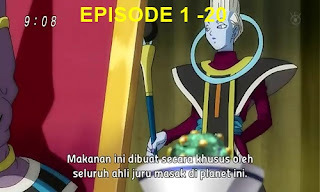 Eps 20 - A Warning From Jaco! Freeza and 1,000 Soldiers are Fast Approaching!